The mill is closed for the winter … we still do mail order. And, we are doing a farmer’s market in Indianapolis on Saturdays. Yes, it is indoors. 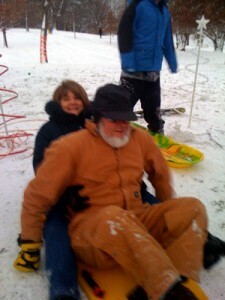 Today, Sunday – 27th of Dec…… We went sledding with the grand kids. On this run I told Karen I was going to get to the bottom of the hill before her. The sled turned around and she got to the bottom first ! ? ! ? ! I did enjoyed the information shared here. Thank you.